Diane Simmons is an associate professor of English at the City University of New York – Borough of Manhattan Community College. 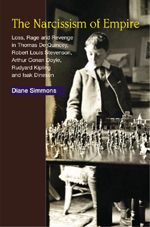 Dr Simmons has published two previous monographs, Jamaica Kincaid and Maxine Hong Kingston, as well as two novels. An excerpt from The Narcissism of Empire was awarded the Heinz Kohut prize. Widely read in the age of British imperialism and still popular today, the five writers studied here have allowed millions to participate vicariously in the imperial project. Yet all of these writers, so instrumental in popularizing the imperial agenda of power and dominance, bore deep emotional scars and as adults bolstered their fragile psychic states through fantasies of empire. While soldiers and politicians may know to bury or at least camouflage their fears and desires, inner fantasy is the necessary ingredient of literature, and popular fiction often offers the opportunity to probe the mind of an age. The connection between childhood loss and the desire for imperial escape, power and dominance is illuminated by De Quincey’s mad screeds against the Chinese as both terrifyingly powerful and laughably weak, while Stevenson’s romances, though written from an invalid’s bed, are credited with “selling” the idea of empire as manly adventure. Conan Doyle’s tales of a Britain menaced at home by imperial blowback are models of Great Power paranoia that resonate today, and Kipling’s stories of imperial Britain grow increasingly grandiose as childhood’s psychic wounds are re-opened. Finally, Dinesen portrays plantation life in British East Africa as a gentle romance in which displaced African “squatters” serve as loyal and adoring retainers, providing the aristocratic aura for which the author yearns. It is sometimes said that, “Love’s loss is empire’s gain,” and for these writers, Simmons shows, empire presented a magnificent opportunity to compensate for childhood calamity. Using the theories of Heinz Kohut, W. R. D. Fairbairn, and D. W. Winnicott, Simmons argues that her subjects were caught between triumphal and pessimistic imperialisms reflecting, respectively, the civilizing mission Britain proclaimed and racial/economic exploitation. Simmons presents her thesis in a unique, cross-disciplinary way that will, I think, make it useful for readers who are interested in both psychological approaches to literature and in British imperialism — without being specialists in the field … What Simmons does, that I don’t think anyone else has yet done is to combine the basic framework of relational theories of narcissism with a simple, easily grasped overview of imperial culture, in an elegant style blessedly free of jargon. She thus cuts across these two fields of psychoanalytic and colonialist literary studies in a very accessible way. This is a remarkable account of the emotional inner world of the western imperialist. Simmon’s scholarship is comprehensive, insightful, complex, and very intelligent.